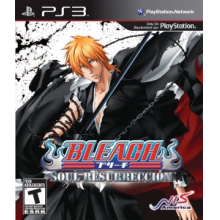 Bleach: Soul Resurreccion is a pretty great fighting game. Based around a specific arc from the manga/anime, you follow Ichigo as he tries to save the world from the menace that is Aizen. The combat system is actually a lot of fun. You have the health gauge, the spiritual pressure gauge, and the ignition gauge. The health gauge is pretty evident as to what it does, the spiritual pressure gauge is what you use to use energy attacks such as beams or projectile slashes, etc. It refills over time unless a mission constraint states otherwise. The ignition gauge fills up as you deal damage and receive it, with large combos filling it up much faster than single hard hits. The ignition gauge, once full, allows you to enter Ignition mode where your attacks do a lot more damage, you move faster, etc. for as long as the gauge is not empty. It slowly lowers with time. You also gain access to your Ignition attack, a very powerful attack that deals tons of damage but takes you out of Ignition mode immediately. Probably one of the best things about this game is that every character plays differently. Ichigo plays a lot differently from Rukia, or even Kenpachi. There are quite a few anime games out there where each character is kind of a cookie cutter character with just a different move set, but each character has their own strengths and weaknesses and that’s one reason why this is such a great fighter. There is an extensive upgrade system where you use soul points that you gather in missions, story mode, etc. by defeating enemies and destroying structures in the level in order to upgrade your character’s health, attack power, even unlock special attributes and moves, etc. When you unlock a new character for use, their board gets added to the rest of them, and when you complete certain conditions (such as a character reaching certain level) you can use that persons board with any other character once you manage to upgrade your way there. The story mode is disappointingly short, only 14 chapters and you’re done with the story mode completely. They make up for this by adding new difficulties as you complete harder ones, but in the end it just isn’t the same at all. Mission mode is awesome, there are a lot of different missions to complete (29 in all), and they have unique restrictions or enemies to face that don’t even appear in story mode at all. There is also a soul attack mode that offers some more things for you to complete, but overall this is a very bare bones fighter. You can spend a lot of time doing missions to upgrade your characters but in the end you’ll probably get very frustrated with the lack of content. Other than that, though, it’s a great game with some great stage layouts and a great battle system that is a joy to play. Once you finish most of the content you won’t really want to go back and play it more unless you’re a die hard Bleach fan, and it lacks any sort of co-op or even vs mode, but honestly it’s a fun game. Its shortness is probably one of its biggest shortcomings and it isn’t really worth the $59.99 price tag, but it is a good game for what it is. If you love Bleach, you should definitely play this game.